Definition at line 36 of file rpcdcep.h. Definition at line 40 of file rpcdcep.h. Referenced by determine_pointer_marshalling_style(), es_data_alloc(), es_data_read(), hello_CtxClose(), hello_CtxHello(), hello_CtxOpen(), I_RpcFreeBuffer(), I_RpcGetBuffer(), I_RpcReAllocateBuffer(), I_RpcSend(), I_RpcSendReceive(), ndr_async_client_call(), NdrClientContextMarshall(), NdrComplexArrayMarshall(), NdrComplexStructMarshall(), NdrGetBuffer(), NdrInterfacePointerMarshall(), NdrInterfacePointerUnmarshall(), NdrpCompleteAsyncClientCall(), NdrProxyGetBuffer(), NdrProxySendReceive(), NdrSendReceive(), NdrServerContextMarshall(), NdrServerContextNewMarshall(), NdrServerContextNewUnmarshall(), NdrServerContextUnmarshall(), NdrServerInitializeNew(), NdrStubCall2(), NdrStubGetBuffer(), RPCRT4_ReceiveWithAuth(), safe_buffer_increment(), safe_copy_to_buffer(), test_client_init(), test_conf_complex_array(), test_conf_complex_struct(), test_conformant_array(), test_conformant_string(), test_iface_ptr(), test_marshal_VARIANT(), test_ndr_buffer(), test_ndr_simple_type(), test_nonconformant_string(), test_nontrivial_pointer_types(), test_pointer_marshal(), test_server_init(), test_simple_struct_marshal(), test_struct_align(), union_arm_marshall(), WriteConformance(), and WriteVariance(). Definition at line 41 of file rpcdcep.h. Referenced by hello_CtxClose(), hello_CtxHello(), hello_CtxOpen(), I_RpcGetBuffer(), I_RpcReAllocateBuffer(), I_RpcSend(), m_CtxOpen(), ndr_async_client_call(), NdrGetBuffer(), NdrpCompleteAsyncClientCall(), NdrProxyGetBuffer(), NdrProxySendReceive(), NdrSendReceive(), NdrServerInitializeNew(), NdrStubCall2(), NdrStubGetBuffer(), RPCRT4_ReceiveWithAuth(), test_client_init(), test_marshal_VARIANT(), test_ndr_buffer(), and test_server_init(). Definition at line 39 of file rpcdcep.h. Referenced by CtxClose(), CtxOpen(), hello_CtxClose(), hello_CtxHello(), hello_CtxOpen(), I_RpcSend(), m_CtxClose(), m_CtxOpen(), m_CtxOpen2(), ndr_client_call(), NdrClientContextUnmarshall(), NdrClientInitializeNew(), NdrContextHandleInitialize(), NdrpCompleteAsyncClientCall(), NdrServerContextNewUnmarshall(), NdrServerContextUnmarshall(), NdrStubCall2(), and UserMarshalCB(). Definition at line 38 of file rpcdcep.h. Referenced by I_RpcAsyncSetHandle(), I_RpcFreeBuffer(), I_RpcGetBuffer(), I_RpcNegotiateTransferSyntax(), I_RpcReceive(), I_RpcSend(), NdrClientInitializeNew(), NdrContextHandleInitialize(), NdrContextHandleUnmarshall(), NdrGetBuffer(), NdrServerContextMarshall(), NdrServerContextNewMarshall(), NdrServerContextNewUnmarshall(), NdrServerContextUnmarshall(), test_client_init(), and test_ndr_buffer(). Definition at line 47 of file rpcdcep.h. Definition at line 46 of file rpcdcep.h. Definition at line 42 of file rpcdcep.h. Referenced by I_RpcSend(), NdrClientInitializeNew(), NdrStubCall2(), and test_client_init(). Definition at line 45 of file rpcdcep.h. Referenced by I_RpcAsyncSetHandle(), I_RpcFreeBuffer(), I_RpcNegotiateTransferSyntax(), I_RpcReceive(), I_RpcSend(), and NdrClientInitializeNew(). Definition at line 48 of file rpcdcep.h. 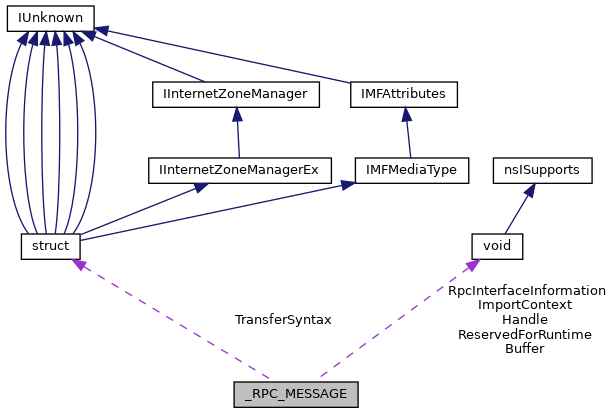 Referenced by I_RpcSend(), ndr_async_client_call(), ndr_client_call(), NdrClientInitializeNew(), NdrpCompleteAsyncClientCall(), NdrStubCall2(), test_client_init(), test_ndr_buffer(), and test_server_init(). Definition at line 44 of file rpcdcep.h. Referenced by I_RpcNegotiateTransferSyntax(), I_RpcSend(), NdrClientInitializeNew(), NdrStubCall2(), and test_client_init(). Definition at line 43 of file rpcdcep.h.